Creatine monohydrate is the #1 bestselling workout supplement of all time, but how does it work and how effective is it, really? If there’s one supplement that has truly passed the test of time, it’s creatine monohydrate. It helps you gain muscle and strength faster. And moreover, it does it all naturally and safely. And in this article, we’re going to talk about why. By the end, you’re going to know what creatine monohydrate is, how it works, how effective it is, how to take it for best results, and more. How Does Creatine Monohydrate Stack Up to Other Forms of Creatine? 1. Does Caffeine Interfere with the Effects of Creatine Monohydrate? 2. Do You Need to Take Creatine Monohydrate Every Day? 3. Do You Need to Cycle Creatine Monohydrate? 4. Does Creatine Monohydrate Cause Bloating? 5. Is Creatine Monohydrate Bad for Your Kidneys? 6. Should Women Take Creatine Monohydrate? 7. Should You Take Creatine When You Want to Lose Weight? 8. Does Creatine Cause Baldness? 9. Does Everyone Benefit Equally from Creatine Monohydrate? Creatine is a natural compound made up of the amino acids L-arginine, glycine, and methionine. Creatine monohydrate is creatine with one molecule of water attached to it. Our bodies can produce creatine naturally, but they can also absorb and store creatine found in various foods like meat, eggs, and fish. The most basic unit of cellular energy is a molecule called adenosine triphosphate (ATP). For a cell to use ATP, it must first break it down into several smaller molecules, and this process produces byproducts that are then “recycled” back into ATP to be used again, including one of particular interest here: adenosine diphosphate (ADP). The more ATP your cells can store and the faster they can regenerate it after use, the more work they can do. This is true of every bodily system, including your muscle cells. Creatine is an essential ingredient in the process of regenerating ATP, which is why supplementing with it increases the amount of work that your muscles can do. Specifically, creatine accelerates the regeneration process by”donating” a molecule of a substance that allows your body to rapidly convert ADP into ATP, thereby significantly increasing your muscles’ functional capacity. The downside to this system of energy generation, though, is the body’s natural creatine stores are very limited. Once they’ve been depleted, the show is over, and the body has to turn to glucose or fatty acids to continue producing ATP. When you take a creatine supplement, however, your total body creatine stores rise significantly, with an average increase of 10 to 20% in your muscles. This provides your muscle cells with much higher levels of readily available energy, which, unsurprisingly, improves anaerobic capacity, strength and power, and resistance to fatigue. Creatine is mostly popular with athletes and weightlifters because its biggest benefits relate to physical activities that involves short, powerful bursts of effort. One of the unique properties of this molecule, though, is that it can also significantly benefit higher-rep training by increasing the number of reps you can complete before reaching complete muscular failure, and there’s some evidence it may even improve endurance performance. Plus, it has a few unique health benefits that have nothing to do with looking pretty. It allows you to lift heavier weights for more reps, which gives your muscles a stronger stimulus to grow. It increases the water content of muscle cells, which positively influences muscle growth in a few different ways. Evidence for the first point comes to us from a study published in 2001 by researchers from Skidmore College. 10 people who took creatine only. 10 people took a placebo and lifted weights. 10 people took creatine and lifted weights. The first 2 groups had no significant increase in lean mass, whereas the group that took creatine and lifted weights gained almost 4 pounds of lean mass in 1 month. Now, some people would say that this extra “lean mass” was nothing but increased water retention, and they wouldn’t be entirely off-base. This also brings me to the second point above. The primary way creatine increases muscle growth is by increasing the water content in muscle cells. This makes the muscles bigger, of course, but also positively impacts nitrogen balance and the expression of certain genes related to hypertrophy (muscle growth). Other research suggests that creatine also has anti-catabolic effects, which further helps with long-term muscle gain. So, the bottom line here is even when you account for the increased water retention, people supplementing with creatine will generally gain muscle faster than those who don’t. In 2003, scientists from Bloomsburg University analyzed 22 of the highest quality studies on creatine to see just how effective it really is. They looked at how much weight people were able to lift for 1, 3, and 10 reps while following a strength training plan for several weeks. On average, people who took creatine were able to lift 20% more weight across all rep ranges, whereas people who took a placebo only improved their lifts by 12%. In other words, creatine improved their performance by 8% (absolute) in a matter of weeks. Curiously, creatine was particularly helpful for increasing bench press 1RM, with increases ranging from 3 to 45%. Thus there is substantial evidence to indicate that creatine supplementation during resistance training is more effective at increasing muscle strength and weightlifting performance than resistance training alone, although the response is highly variable. So, if you want to get strong as fast as possible, then you want to take creatine. “Power” refers to how quickly you can move a certain amount of weight, whereas “strength” is the absolute amount of weight you can move (regardless of how quickly you move it). Power isn’t all that meaningful if you just want to get big and strong, but it’s important in many sports. Thanks to its ability to fuel rapid muscle contraction, studies show that creatine increases power output in sprinters, swimmers, wreslers, and weightlifters. It’s also possible that creatine may directly improve power output through some other mechanism, as one study found that a single large dose of creatine improved neuromuscular function and increased power output within 24 hours, which is before it would have accumulated in muscle tissue. It’s worth noting that if you’re a vegan or vegetarian, then you’ll likely notice the biggest benefits in power output. Plant-based diets tend to be very low in creatine because the best food sources of creatine are meat, poultry, and fish, so it’s no surprise that plant-based eaters can benefit greatly from creatine supplementation (and that they see the largest increases in power output). There isn’t much research on how creatine affects recovery, but it does appear to enhance it. One study on long-distance runners found that creatine supplementation reduced markers of muscle damage and inflammation after an 18-mile race. Other research shows that creatine can reduce glycogen and muscle protein breakdown during a period of hard training. Many people think of creatine as a supplement only for increasing strength and power, but it’s also proven to increase muscular endurance. The same group of researchers from Bloomsburg University found that creatine increased the amount of reps people could do with their one-rep max by 26%, compared to just 12% for a placebo. Once again, creatine was particularly helpful for increasing bench press performance, with increases of 16 to 43%. Creatine supplementation also seems to reduce fatigue in endurance exercise, too. Scientists from the University of Nicosia and the University of Oklahoma found that creatine supplementation significantly reduced perceived effort (how hard exercise feels) during an intense cycling workout. In one of these studies, though, only people who had relatively low levels of muscle creatine before supplementing experienced these benefits, so it’s possible that those of us starting with normal levels may not notice a reduction in perceived effort. Strengthening your muscles is one of the better ways to reduce joint pain, so if creatine can help increase strength, can it also help reduce joint pain? That’s what a group of scientists from the Division of Rheumatology-University of São Paulo wanted to find out. They had one group of women take creatine and another take a placebo while doing 12 weeks of lower leg strengthening exercises, and at the end of the study, the results in the creatine group far surpassed the placebo group. The women who took creatine showed a 52% reduction in knee stiffness, a 45% reduction in pain, and a 41% improvement in overall joint function, whereas the placebo produced a moderate reduction in pain and no significant reduction in knee stiffness or joint function. The scientists weren’t exactly sure why creatine worked so well, though it’s possible that the benefits were simply due to making the workouts more productive. It’s well established that strength training is one of the best ways to reduce type 2 diabetes symptoms. Can creatine amplify these benefits? That’s what scientists from the University of São Paulo found in 2011. They gave one group of diabetics creatine and another group of diabetics a placebo, and put everyone through the same 12-week strength training program. By the end, the creatine group saw a significantly larger drop in their HbA1c levels, which is a marker of their average blood glucose levels over the past 3 months. They also experienced a smaller rise in blood glucose levels after a meal, which is a sign of better insulin sensitivity, as well as other biological markers of better metabolic health. Creatine monohydrate is the simplest and least expensive form of creatine on the market. It’s been around for decades and is a tried-and-true winner, but it has many challengers to its throne. Over the years, manufacturers have modified creatine in various ways to make it more effective. How well have these experiments gone? Has anything been able to trump creatine monohydrate? Creatine ethyl ester, or CEE, is a form of creatine monohydrate that has undergone a process called esterification, which involves introducing an acid and alcohol. CEE was developed in the hopes that it would increase the absorption and bioavailability of the creatine, but research shows it’s a dud. A direct comparison between CEE and creatine monohydrate shows that CEE can’t even duplicate, let alone surpass, the results seen with creatine monohydrate supplementation. In other words, it’s completely worthless. The reason for this is CEE is less stable than creatine monohydrate, resulting in its rapid conversion into a substance called creatinine, which has no beneficial effects in the body. Buffered creatine is creatine monohydrate combined with magnesium or baking soda to raise its pH value. In chemistry, pH is a measure of the acidity of a solution. A pH of less than 7 is said to be “acidic” while a pH greater than 7 is “basic” or “alkaline,” and the more acidic a substance, the more it can react with other substances and cause chemical changes. The idea behind buffered creatine is to “protect” it against the stomach’s powerful acids, and thereby increase its absorption into the bloodstream. Unfortunately, research shows that buffered creatine isn’t any better than creatine monohydrate, because stomach acid is too strong to be negated by any buffering agent that you could safely eat. The good news, though, is creatine is naturally resistant to stomach acid. Studies show that 80 to 100% of the creatine that you ingest will make it through your stomach unchanged, so it doesn’t need the help of a chemical buffer. As usual, the goal was to increase creatine absorption and efficacy. Well, it succeeded in improving the powder’s water solubility, but it hasn’t been shown to enhance uptake or performance benefits. Magnesium plays a role in creatine metabolism, so combining the two could theoretically improve its effectiveness. There isn’t much research on it yet, but one study found that creatine magnesium chelate is no more effective than creatine monohydrate. We’ll have to see how it pans out in further research. Some research shows that malic acid can increase energy production in cells, which could work synergistically with creatine to further increase performance. The jury is still out on this one, though, because no studies have directly compared it to creatine monohydrate yet. Creatine nitrate is a form of creatine bound with chemicals called nitrates, which are abundant in certain foods like beets and spinach. Research that’s no longer available online indicated that creatine nitrate may be more water soluble than creatine monohydrate, and we know that nitrates can improve performance, but no studies have directly compared creatine nitrate to monohydrate yet. We’ll have to wait and see what the science says. Micronized creatine is creatine that has been processed to reduce the particle size of the powder. Most of the micronized creatine you can buy is creatine monohydrate, and while micronization helps it better dissolve in water, it doesn’t increase absorption or effectiveness. Your body “micronizes” creatine during digestion by breaking it into smaller particles, so “pre-micronizing” it doesn’t achieve anything special beyond making it easier to drink. Remember, your body already can absorb a large percentage of the creatine provided by creatine monohydrate, so slightly improving this doesn’t have any significant effect. Creatine citrate is creatine bound to citric acid. Creatine citrate is more soluble than creatine monohydrate, but no better in terms of end results. Liquid creatine is a form of creatine–typically monohydrate–suspended in water. This was conceived of more as a marketing gimmick than anything else, and studies show it’s far less effective than creatine monohydrate. The problem is when creatine is mixed with a liquid, it begins to break down into creatinine, which, as you know, delivers none of the benefits of creatine. So, by the time a liquid creatine product gets into your hands, it’s really not a creatine supplement, but a creatinine supplement. Oh, and if you’re worried this means the creatine in your post-workout shake isn’t as effective, rest easy. It takes several weeks for the creatine to break down into creatinine after being mixed with water, so mixing your shake a few hours before your workout is totally fine. Research shows that supplementing with 5 grams of creatine monohydrate per day is optimal. When you first start taking creatine monohydrate, you can “load” it by taking 20 grams per day for the first 5 to 7 days, and see benefits sooner. Research shows that taking creatine with a moderate amount of protein and carbohydrate increases muscle absorption. Studies show that taking creatine after a workout is slightly more effective for increasing strength and muscle gain than taking it before. Thus, creatine is the perfect supplement to take after a workout, with a meal. There are a lot of myths and misconceptions about creatine monohydrate. For example, some people say you shouldn’t take it with caffeine. Others say it causes hair loss, bloating, and kidney damage. You may have also heard that it simply doesn’t work for some people or that its benefits are generally exaggerated. What’s the story with these and similar claims? It depends on what kind of training you’re doing. It’s well established that caffeine increases performance, so taking it with creatine should have an additive effect. That’s not always the case, though, as sometimes these two molecules don’t play nicely together. One study found that taking caffeine with creatine before lifting weights interfered with creatine absorption and negated its benefits. We should note, however, that this study included just 9 subjects and the results haven’t been replicated by other research, so we shouldn’t draw any definitive conclusions from it. We also have two other studies on high intensity interval training that found that taking caffeine and creatine together improved performance over and above what you’d expect from caffeine alone. This may have been due to the neurological enhancement discussed earlier or some other mechanism not yet understood. So, at this point, we aren’t quite sure yet what to expect when you take creatine with caffeine before a workout. If you want to play it safe, take your caffeine and creatine separately, which is a moot point for most of us who take caffeine before workouts and creatine after (which is what you should be doing to get the most benefit from both). It takes about a week for creatine to accumulate in your muscles once you start supplementing with it, and once it has, it takes some time to return to normal levels once you stop. A single workout doesn’t use up much creatine, so once your muscles are topped off through supplementation, you can go several days or even weeks before your intramuscular creatine levels return to baseline (depending on your training and diet). That said, the simplest way to ensure you get the most out of creatine supplementation is taking 5 grams per day, which ensures your body’s creatine stores always remain elevated. That may sound ominous but don’t mistake creatine for steroids, which can shut down (and even permanently damage) your natural testosterone production. If you take a massive dose (30+ grams), it’s possible you may notice something odd going on in your stomach, but there’s no reason to ever take that large of a dosage. One of the reasons people still believe creatine stresses the kidneys is related to a substance known as “creatinine,” which is produced when your body metabolizes creatine. In fact I think it’s one of the best supplements you can take when you’re dieting to lose fat because it helps you preserve muscle and strength while in a calorie deficit. This fear arose after a study conducted by scientists at Stellenbosch University found that male rugby players taking creatine saw a 40 to 60% increase in DHT levels after 3 weeks of creatine usage. DHT stands for dihydrotestosterone, which is a hormone that’s largely responsible for male-pattern baldness. If you’re susceptible to hair loss, raising DHT levels is going to cause it to happen quicker. Thus, people started to worry that taking creatine would make them lose their hair faster. So far, this is the only study that has associated creatine supplementation with an increase in DHT levels. Random, unrepeatable findings aren’t uncommon in scientific research, and this may be one of those cases. The study only lasted 3 weeks, and DHT levels started to decline significantly after the first week when the athletes took a much larger dose of creatine. Therefore, it’s possible that DHT levels would have dropped back to baseline after a few more weeks of usage. The researchers didn’t explain what the athletes were eating or how much, or how they were training or sleeping, which are factors that can affect DHT levels. DHT levels can vary wildly throughout the day, and the researchers didn’t say whether or not they tested all of the subjects at the same times throughout the study. It’s not uncommmon for low-quality supplements to be contaminated with impurities or deliberately spiked with actual steroids to increase their effectiveness, and the study authors didn’t list which creatine supplement they used or who made it. That last point is the most important one because shenanigans in the supplement industry are more common and severe than many realize. For example, one study found that trace amounts of the anabolic steroid norandrostenedione in a creatine supplement were enough to make people fail a drug test. Anecdotally, I’ve also worked with thousands of people and have spoken with dozens of coaches and researchers, and I’ve never heard someone complain of hair loss after taking creatine. So, in the final analysis, there’s very little reason to believe creatine contributes to baldness. Research shows that a small portion of the population doesn’t benefit from creatine supplementation, most likely because they already get enough from their diets. It’s also possible that these people don’t absorb creatine supplements as well as the rest of us. If you’re worried you may be a “nonrespnder” because you haven’t noticed a big increase in your body composition or workout performance, don’t give it up just yet..
First, remember that the benefits are relatively small and hard to notice in the short term. For instance, with creatine, you might be able to get 1 or 2 more reps with a given weight or move a little more weight in your heavy sets. This is unimpressive in and of itself, but can definitely add up to significant improvements over time. Second, it’s possible that other lifestyle factors are masking the benefits of creatine. For example, if you haven’t been getting enough sleep recently, then the negative effects of sleep loss are going to override any benefits you might be experiencing from taking creatine. Third, it takes time for creatine to accumulate in your muscles, so you should take it for at least 4 weeks before you pass final judgement. If you don’t want to wait, you can “load” it to see benefits faster by taking 20 grams per day for the first 5 to 7 days (followed by a maintenance dosage of 5 grams per day). Fourth and finally, people who are closer to their genetic potential for muscle growth and performance benefit less from creatine supplementation. This is simply because progress is too slow at that point to notice a significant difference with even the best natural muscle-building supplements (including creatine). …and you truly don’t notice any difference with or without at least 4 weeks of regular creatine supplementaiton, then you may be one of the few people who simply doesn’t benefit from it. Creatine is the most studied, proven, and time-tested supplement in all of sports nutrition. If you’re into weightlifting or athletics of any kind and haven’t tried it, then you’re missing out. And there’s also evidence that it can reduce fatigue during exercise, joint pain, stiffness, and discomfort, and even symptoms of type 2 diabetes. Plus, it’s safe, cheap, and readily available. All you have to do to get the benefits of creatine is take 5 grams per day or, if you want to see benefits faster, take 20 grams per day for 5 to 7 days and then reduce intake to 5 grams per day. If you want to get the most out of creatine, then you may also notice greater benefits by consuming it post-workout and without caffeine. If you’re buying anything other than creatine monohydrate, you’re probably overpaying for the same or lesser benefits. That’s why it’s still the gold standard by which all other forms of creatine are judged, and the best bang for your buck. That’s also why I chose it for my 100% natural post-workout supplement, Recharge. 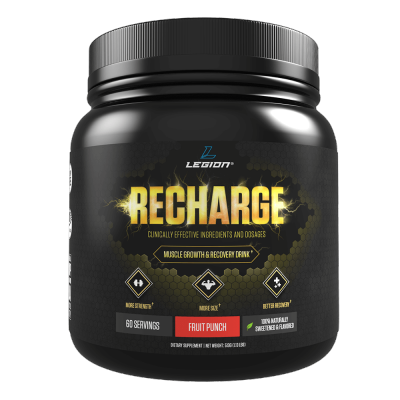 In addition to 5 grams of creatine monohydrate per serving, Recharge also includes clinically effective dosages of L-carnitine L-tartrate and corosolic acid to help you gain muscle and strength faster and recover better from your workouts. If you want to be able to push harder in the gym, train more frequently, and get more out of your workouts, then you want to try Recharge today. What’s your take on creatine monohydrate? Have anything else to share? Let me know in the comments below!